After the financial crisis, the investment banking mantra became “Shanghai, Mumbai, Dubai or goodbye.” While the rest of the world was falling apart, the countries stretching from Saudi Arabia to India, Southeast Asia and China were growing, and could pick up some slack. Or so the thinking went. But the swingeing decline in the Asian equities business – the most expensive pillar of Wall Street’s expansion – suggests this was a fallacy. A retreat now looks inevitable. 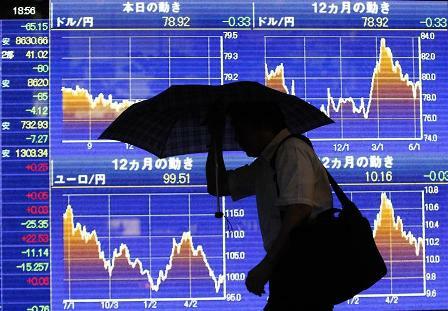 Stockbrokers have flocked to Asia since 2008. Aside from the big Wall Street firms like Goldman Sachs and JPMorgan and European universal banks like Credit Suisse and UBS, a number of secondary players have bulked up, from U.S. broker Jefferies, the U.K.’s Barclays, Australia’s Macquarie, Japan’s Nomura, and China’s ICBC. It’s easy to see what attracted them. Commissions for trading shares were higher in Asia than elsewhere, mainly due to the scarcity of efficient electronic trading platforms. Competition was still thin, particularly in equity derivatives and prime brokerage. Robust local savings rates and strong growth spurred hope for higher trading volumes and fund raisings alike. Oops. The value of share trading in the Asia Pacific region fell 22 percent in the first half of 2012, outpacing declines not only in the Americas, but even in the basket case of Europe. Meantime, commissions have been squeezed, falling by as much as 30 percent alone in the past two years in some markets as new entrants have tried to rapidly build market share. Sales of new shares – usually a venture between equities and corporate finance departments – have also taken a hit. Equity proceeds in Asia Pacific (ex-Australia) dropped by 31 percent so far this year to $11.3 billion, according to Thomson Reuters. That’s double the rate of decline in the United States. Moreover, an increasing number of banks are scrounging at that shrinking pie. PICC’s proposed $3 billion Hong Kong IPO later this year will have a whopping 17 underwriters. Add it all up, and instead of being a profit engine, the pan-Asian equities business has become a drag. To offer a full complement of cash, derivatives and prime brokerage services across the region – including share trading, research and compliance – can cost some $800 million a year, according to one executive. Only one or two firms have revenue of that scale. The pain is starting to show. Macquarie Group’s income from Asia fell 35 percent in the year ended March, compared with a 19 percent gain in Europe and 8 percent decrease in the Americas. Jefferies highlighted the costs of its Asian expansion in its most recent quarterly report, when earnings fell 21 percent from the year before. The retreat has already started. Samsung Securities shut operations in the region outside Korea a few months ago. Royal Bank of Scotland is selling most of its Asian equities division to Malaysia’s CIMB Group. Credit Agricole is in talks to offload its stake in CLSA. Investors focused on troubles in Europe as global banks report their earnings this week may want to ask what plans they have for their Asian operations. The value of share trading in the Asia Pacific region fell 22.4 percent in the first half to $7.6 trillion, outpacing a 14.4 percent drop in the Americas and a 21.5 percent decrease in Europe, according to the World Exchange Federation. Equity and equity-related proceeds in Asia Pacific ex-Australia fell by 31 percent in the first half of 2012 to $11.3 billion. In comparison, equity-related proceeds in the United States fell 16 percent, and globally, they fell 33 percent, according to Thomson Reuters. The top five banks in Asia equity and equity related proceeds are Goldman Sachs, Citi, UBS, Morgan Stanley and JP Morgan. Together the top five banks made up 36 percent of the total offerings, as compared to 59 percent of the total in the United States.